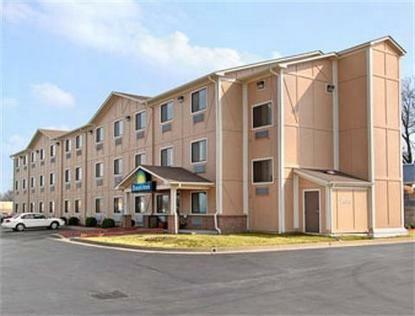 Guests receive a Complimentary Continental Deluxe Breakfast with their room, property amenities include 3 floors, interior corridor with elevator, fitness facility at nearby gym free of charge for guests, free USA Today paper, free high speed wireless internet, local calls, and parking. Laundry services available for a fee (inquire at hotel). The hotel allows Pets with a $10.00 Non-Refundable charge per night per pet up to 15 pounds in weight only. Standard amenities include a/c, alarm clock, cable tv, microfridge, hairdryer, telephone w/dataport, coffeemaker, and iron w/board. All rooms include queen beds, kings are available. Large vehicle parking available. This property is a 5 Sunbursts property.